Now that it is September, I feel a moral pat on the back about going back to the fish market. However, recently I have been coming across industrious enterprising people who clean and debone fish for you and have opened outlets all over our major metros, taking the toil out of fish buying. Chennai has two such places, I am told; Mumbai has one such person in the south who delivers and several in the suburbs, and I’m sure New Delhi is the same. A French dish that I love, but which is so often badly done, is Fish Meunière. In France, it is usually made with sole, but a perfectly wondrous dish can be made with pomfret. Fillets of fish are supposed to be dredged (a little more than dusted) with flour (never eggs or breadcrumbs) and cooked in a frying pan until a light golden crust forms, leaving the inside moist and flavourful. You then make a sauce by browning some butter, to which you add some lemon or lime juice and chopped parsley, and pour this over the fish. What could be more simple or more delicious? Unfortunately, it is easier said than done. I have often wound up eating soggy, pale fillets in a pool of greasy sauce to which cream is added. When attempting this at home, my fish used to stick to the pan and then fall apart while serving. I realized that the simplicity of the dish makes it imperative that everything be prepared and cooked just so. The fillets of fish must ideally be about ½" thick and weigh about 200-250g each. You must pat your fish dry with a cloth or else the flour will become thick and gluey. Season your fish with salt and pepper and let it sit like that for a few minutes. A little moisture will be drawn out of the fish because of the salt. This is a good thing and allows an even coating of the flour all around the fish when dredged. After dredging the fish, shake off the excess flour. I used to use a heavy skillet for pan frying fish. This, I discovered was wrong and was the reason my fish stuck. I now use a 12" non-stick pan which is perfect for this dish. Use equal quantities of butter and olive oil to fry the fish, not too much since you have the browned butter coming on top. Using a combination of both ensures that you have taste (butter), and that the fish won’t burn (olive oil). With only butter, it would brown too much, maybe even burn. Start by cooking your fish on high heat, then lowering it to medium once the fish has browned slightly. It should not take more than three to four minutes to cook two fillets in one pan. Remember that fish continues to cook in a hot pan even when it is off the gas. Instead of testing if the fish is almost done with a knife which pierces the flesh, try a toothpick which works well. Brown some butter in a steel pan (because you can’t see when it is brown in a non-stick one). Add the lemon juice. Place your fish on to warm plates and pour this over the fish. Sprinkle with parsley and serve at once. A couple of tips: to easily turn fish fillets without breaking them, use two spatulas—a regular one and an extra wide one especially designed for fish. Flat fish fillets have two distinct sides, and it makes a difference which one goes into the pan first. The side of the fillet near the bones browns best and makes the most attractive presentation on the plate, the skin side of the fillet is darker. When cooking, start with the bone side down, flip them and slide them on to a plate so that the skin side is at the bottom. Once you have seasoned and dredged your fish, place the fillets on a baking tray or plate. Heat half the butter and half the oil together in a non-stick pan. When hot, carefully place two fillets in a pan, reduce the heat to medium high and cook for about three minutes without moving the fish, until the bottom is golden brown. Gently flip the fish over and cook on the other side for about a minute more. Transfer the fillets to individual dinner plates. Wipe the pan with a kitchen paper towel and repeat with the remaining fillets. In another pan, heat the butter until it melts. Continue to cook until the butter is golden brown and has a nutty aroma; for about one-and-a-half minutes. Remove the pan from the heat, add the lime juice to the browned butter, taste and season with salt. 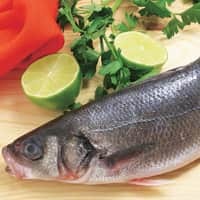 Spoon the butter over the fish, sprinkle with parsley and serve with lemon or lime wedges and simple boiled potatoes. For variation, you can add slivered almonds or capers to the browned butter.